Pronti per un altro caffè? Coffee Break Italian Season 1 finished in the summer, and we get daily emails, tweets and messages asking us when Season 2 is starting… So, we’re delighted to report that your new year resolutions for 2017 can also include improving your Italian! Season 2 begins in January and we’ve been busy recording the first batch of lessons already. 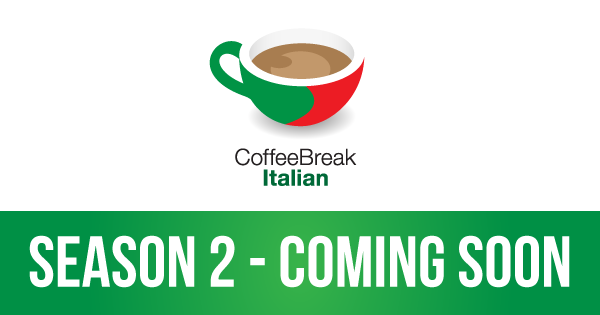 Season 2 will give you the chance to increase your understanding and build your range of expression in Italian and we’re really looking forward to launching this next stage. To be kept up to date with the developments and the definitive launch date, click here and fill in your details. Still working on season 1 but looking forward to season 2. Thank goodness you’re coming back! Grazie, grazie, grazie!!! Will Season 1 still be available for a long time (free online on this site) ???? Because it is taking me awhile to go through all the lessons slowly!!! Grazie mille! The free lessons will be available here on radiolingua.com and on iTunes. Hope that helps. You guys are the best! Thank you for given us the listeners the opportunity to improve our Italian. Coffee break Italian season two is the best new year gift anyone can ask of. You guys rock!